It’s the dog days of summer, which means we are working like dogs to get Gus’s up and running. The concrete is poured. The floors are ready to be polished. But not before we make sure we won’t scuff them up as we install our equipment! So that’s Job One: equipment installations. Second is roof top partying. 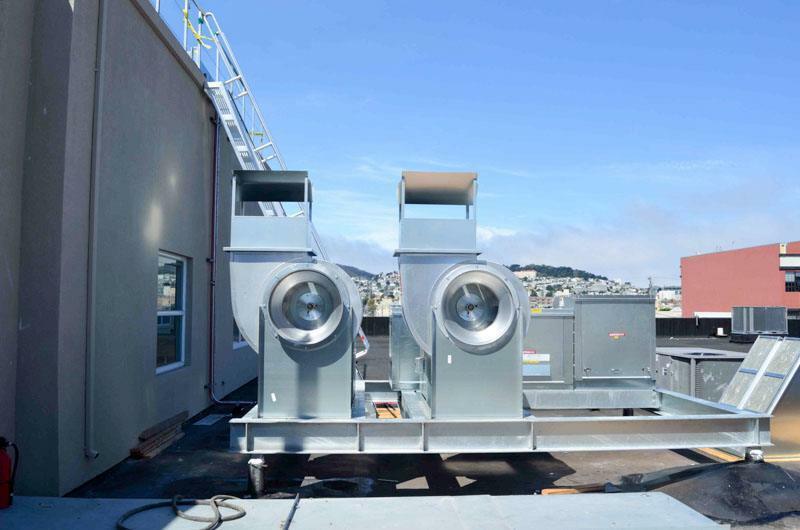 And if you party like we do, that means installing duct shafts, condenser units (for keeping things cool, something we are increasingly obsessed with), and various other needs. Our focus has been energy efficient appliances that operate quietly, so you won’t be distracted as you walk our aisles. Now, our most exciting project: windows. Windows are the eyes of the building, and eyes are the windows to the soul, so our window is our soul, which means our soul is going to be natural light in the cafe. The large new window at the corner of 17th and Harrison is going to be a great place to get sun-drenched while drinking coffee and enjoying our San Francisco weather (or bundling up with Karl, but that’s not bad either). Everything is moving fast, so feel free to stop by and salivate at the thought of future excellent-looking food and groceries! We can’t wait to start serving our community.